Adrian M. Ionescu is a Professor at Ecole Polytechnique Fédérale de Lausanne (EPFL), Switzerland. He received the B.S.&M.S. in Electronics and Telecommunications in 1989 and a Ph.D. degree in microelectronics from the University ‘Politehnica’ Bucharest (former Polytechnic Institute), Romania, in 1994. He has obtained a PhD in Physics of semiconductor devices from the National Polytechnic Institute of Grenoble, France, in 1997. He held staff and/or visiting positions at LETI-Commissariat à l’Énergie Atomique, Grenoble, CNRS, Grenoble, and Stanford University, Stanford, CA, in 1998 and 1999. He was a Invited Professor with the Tokyo Institute of Technology in 2012 and 2016. He is the founder and director of the Nanoelectronic Devices Laboratory (Nanolab) of EPFL. 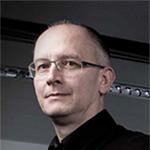 Prof. Ionescu served as Director of the Doctoral Program in Microsystems and Microelectronics of EPFL. The research of Nanolab focused on various subjects in the field of beyond CMOS and More-Than Moore devices and technologies. The group activities are centered on silicon micro/nano-electronics with special emphasis on the technology, design and modeling of new device concepts; steep slope transistors (tunnel FETs and ferroelectric FETs), MEMS and NEMS devices with main emphasis on low power resonator concepts (vibrating body transistors), new materials (carbon nanotubes serving for building suspended gate or body FETs) to achieve novel analog and radio frequency functions and low power sensing, when integrated on silicon platforms. He is the founder and director of the Nanoelectronic Devices Laboratory (Nanolab) of EPFL. Prof. Ionescu served as Director of the Doctoral Program in Microsystems and Microelectronics of EPFL. The research of Nanolab focused on various subjects in the field of beyond CMOS and More-Than Moore devices and technologies. The group activities are centered on silicon micro/nano-electronics with special emphasis on the technology, design and modeling of new device concepts; steep slope transistors (tunnel FETs and ferroelectric FETs), MEMS and NEMS devices with main emphasis on low power resonator concepts (vibrating body transistors), new materials (carbon nanotubes serving for building suspended gate or body FETs) to achieve novel analog and radio frequency functions and low power sensing. Prof. Ionescu has published more than 500 articles in international journals and conference proceedings (https://scholar.google.ch/citations?user=CDI07dYAAAAJ&hl=en&oi=ao ). In 2013 he received the IBM faculty award for contributions to the Engineering field. He is the recipient of the André Blondel Medal 2009 of the Society of Electrical and Electronics Engineering, Paris, France. He was the Technical Program Committee (co)Chair of the European Solid-State Device Research Conference in 2006 and 2013 and General Chair in 2016. Prof. Ionescu has been a co-coordinator of FET Flagship Pilot Guardian Angels for a Smarter Life, an advanced research program that has been selected by the European Commission as one of the six leading candidates for future emerging technologies. In 2015 he was elected as a member of the Swiss Academy of Sciences (SATW). In the same year he received the Outstanding Achievement Award of SATW for the successful coordination and delivery of the first Swiss Technology Outlook, a document that summarizes the work of multi-disciplinary team of experts and provides clear recommendations for decision-makers in the political and economic world (communicated by SATW to the Swiss political authorities). This presentation will report progress in different types of steep slope devices by analyzing their potential for digital, analog, RF and sensing functions at supply voltages below 0.5V. We will show the advances obtain in a complementary technology platform develop in the E2SWITCH FP7 European project. The use of all-silicon tunnel FETs as ultra-low power light sensors, setting the basis of future energy efficient C-TFET imagers, will be reported. Finally, we will highlight some ongoing work on Metal-Insulator-Transition device architectures and their potential applications in digital circuits and Radio-Frequency.